We have two mini dachshunds: Ava and Jaxen. We love them so much and they are such a source of happiness (let's be honest, and laughter) for us. They are best friends. They sit on the top of the couch together looking out the window all day viciously barking at anyone walking by and are obviously "protecting the house" haha. They know what time dinner is: 5 PM and not a minute later. Ava goes by the door and barks at 5 PM and doesn't stop until she gets her food. They both burrow under the blankets all day long. Jaxen loves walks. Ava loves naps. Neither of them are the biggest fans of the kids but they both tolerate them. Jaxen stands right next to Oliver's high chair the entire time that he is eating hoping for any pieces of dropped food. That wink!!! I can't make this stuff up people. Ava is the bane of our existence as she barks/cries for anything she wants all day long. She has zero patience and will literally bark and cry until we drop what we are doing and give it to her. Yes Ava, I am sure that you really needed to come inside 15 seconds after I let you outside which you barked to go out. As you can see, we love our dogs. We love having fun with them. And we love laughing and their crazy antics! My specialty is human nutrition of course as a registered dietitian but I do take interest in nutrition for my dogs as well. According to PetMD, these human snacks are safe for dogs: apples, blueberries, strawberries, watermelon, spinach, lettuce, squash, sweet potato, carrots, green beans and unsalted and unbuttered popcorn. My sister's dog Eli, an Irish Setter, loves snacking on vegetables. Some of my parent's dogs like carrots. We try to mainly stick with dog treats for the dogs so that we do not give them anything that they should not have. As delicious as avocados are, skip them for dogs! According to the ASPCA, dogs should not have chocolate, onions, avocado, citrus, alcohol, caffeine, grapes, garlic or dairy products. There are different reasons for each item such as garlic which is five times more toxic to dogs than onions. Garlic can create anemia in dogs as well as weakness, elevated heart rate and more. Just skip these foods! Do you really know what is in your dog's food? Honestly, before now, I didn't look too much into it. I know to look for the main ingredient to be meat but not that much beyond that. I love my dogs so I decided to take a closer look at what they were eating and I urge for you to do the same for your dogs! Check that your dog's food contains real meat and that it is the number one ingredient. Meijer is a great place to pickup your dog's food (and the cutest pet clothes) including Purina® Dog Chow and Purina® Beneful® products which you get real meat for the right price. I picked up a couple kinds of dog food: Purina Dog Chow Complete Adult with Real Beef and Purina Beneful Healthy Weight with Real Chicken Dog Food. The Purina Dog Chow that I bought is made with real beef, has 100% complete and balanced nutrition for dogs and contains 23 vitamins and minerals. The Purina Beneful that I purchased uses farm-raised chicken as the number 1 ingredient and has apples, carrots and green beans. My dogs love them both which is what matters! I enjoy shopping at Meijer and we get many of our pet products there. This time, I shopped in-store but you can also order your pet food online or do curbside delivery at the store. This would be helpful for carrying heavy dog food bags! 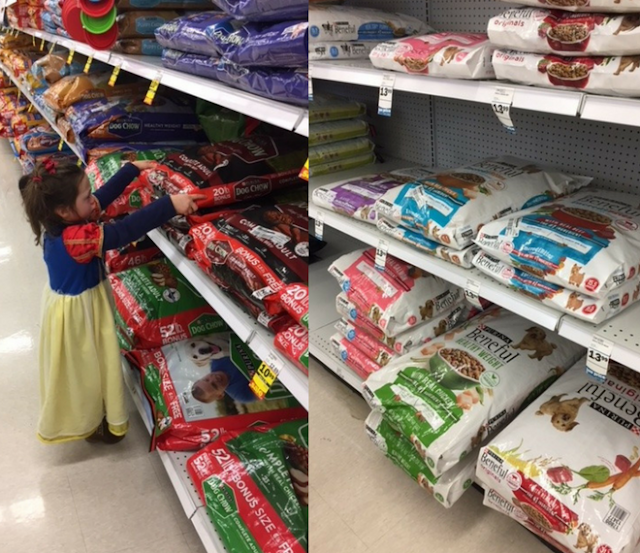 Snow White stocking up on dog food! To save on Beneful and Dog Chow, use the Meijer MPerk offer from 2/4-3/3 for $1 off any size Beneful Dog Food or $1 off a 31 pound bag or smaller of Dog Chow. Here's to loving our dogs and making sure that they eat the foods that are the best for them!